Reverse logistics has evolved from its humble beginnings as the front-end of the retailer’s return process. Now, instead of simply enabling customers to return defective or unwanted products, reverse logistics is a key component of a comprehensive back-end services solution, encompassing technical customer service, credit notes, spare parts management and refurbishing of returned items for resale. Moreover, a Lean reverse logistics function can represent a significant commercial opportunity. As well as reducing lead-times and re-work costs, Lean reverse logistics can help reduce the cost of the total supply chain output. The process offers the chance to gather important information, enabling manufacturers not only to improve product reliability, but also to better understand customer requirements and improve product design accordingly. Furthermore, by eliminating the wasteful use of unnecessary transport, distribution and collection, route planning can be significantly optimised. Total inventory control can be increased, the product disposal process can be facilitated and its associated costs reduced, whilst recycling and refurbishing lead times and costs can be cut. By eliminating waste, Lean solutions can shorten the link between the origination of the return and its corresponding resell, reducing lead times and optimising the aftermarket supply chain. 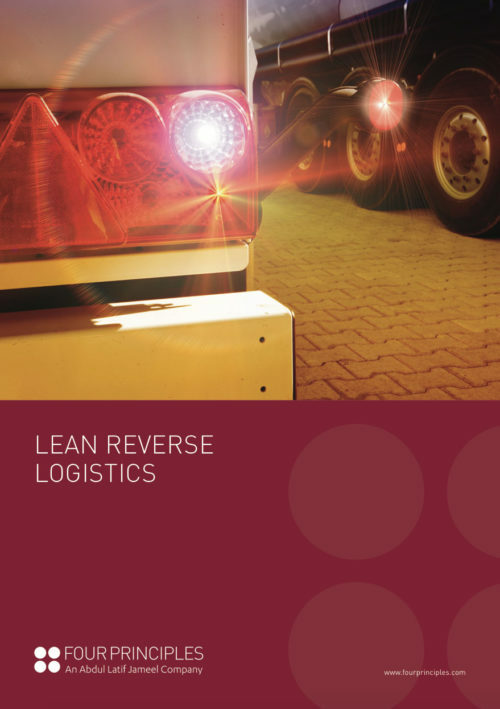 Considered a problem by many, Lean instead views reverse logistics as an important opportunity with plenty of scope for elimination of waste, addition of value and optimisation of refurbishment, value capture or proper disposal, as well as being a key driver of profitable integration between marketing, sales, finance and logistics. From increasing returns revenue and reducing pre- and post-damage direct product costs to the implementation of technological solutions such as TMS, RMS and RFID, Lean return logistics represents a function rich in potential for significant value-add and long-term, sustainable savings. With considerable experience in implementing solutions for clients in a wide range of sectors around the world, Four Principles bring a structured, scientific perspective to Lean reverse logistics.